I've loved the Final Fantasy series for as long as I can remember. The first game I ever played from the series was Final Fantasy 7 ... anyone who loves the series will probably tell you that 7 is the best! They are actually doing a remake for the PS4 but there is no release date just yet - but I am super excited and I've pre-ordered it already - but anyway this post is not about Final Fantasy 7 - it's about Final Fantasy Type-0 HD. The game released on PS4 around 20th March of this year. I bought just after the release date. The first major difference to many other Final Fantasy games is that it utilises a real-time battle system. For those who don't know what means - is that the battle is live and on-going to compare it to another battle type - would be turn-based (meaning - I take a turn, then they take a turn, then back to me and so on). I actually prefer the turn-based battle system ... that is just my preference but real-time battle do have their advantages and are lots quicker. Final Fantasy 10 my second favourite in the series was turn-based however I also really enjoyed Final Fantasy 13 and that was real-time. In this Final Fantasy the player controls a team of 14 students called Class Zero. The world in this series is called Orience. The world map is scaled down to make travelling easier - this can be achieved by walking, by Chocobo, or the airship (when you get it). The game is split into missions and there are also free periods so you can wander around and do other things. For missions you can choose 3 of the 14 students. One is controlled by the player and the other two by the game's artificial intelligence. The other students are kept in reserve incase you get one of party killed. Similar to other games in the series once a enemy has been defeated the player earns experience points to help them level the students. They also receive Phantoma which is used to upgrade the characters magic skills. Similar to Final Fantasy 13 the students also have access to Eidolons (or aeons if you played FF10) - there are lots of different names for them (the players health suffers when you call on them for help though). I do like to be honest with my reviews so I played this for a few hours and didn't really like the storyline. It actually reminded me of another game I played on the PS2. It's probably one of the only Final Fantasy games I've had a negative thing to say about. It's hard to describe when typing it but when I played Final Fantasy 10 and 13 ... I didn't want to eat or sleep or go to work - I just wanted to play it - with this game - I played it and thought 'meh, I'll come back to it' - I haven't yet and that was a couple of months ago and since then a Destiny update and Division came out which I've played lots more of. Let us also remember that I get bored easy - I haven't actually completed Division yet and I'm gone and bought Pokemon Alpha Sapphire and I'm currently half way through that. Have you bought and played this game? What did you think? Let me know in the comments below. A few weeks ago I was thinking about television shows that had been on the air for ages and then were cancelled or run their course. One of those shows was Scrubs! For those of you who have never heard of or watched Scrubs - it was an American medical comedy-drama which ran for nine seasons. The show followed the lives of employees at a fictional teaching hospital. The show focused mainly on John Dorian (or J.D) and his friends/family. He also narrated the show too. I was in HMV over the weekend and saw the boxset for £39.99 and just couldn't resist. I think I watched up to the 6th or 7th season and then it moved to a channel I didn't get. However since its been so long I've started from the beginning. My favourite characters have to be Elliot Read and Bob Kelso. Who are yours? Let me know in the comments below. If you remember more than a year ago ... I bought an Apple Watch - such a great and nifty little invention. I bought the 'sport version' which meant it came with a sport strap and I went with the white option. Over the course of the year the white got dirty and didn't look as good - so when Apple released new straps I was really excited. I first saw them when iJustine (a YouTuber if you don't know) went crazy and bought lots of them to show her subscribers - I think she took most of them back. I decided to go with the Woven Nylon Band in 'Royal Blue' which cost £39. I thought this was reasonable and the sports band is the same price currently. There is not as many colour options with the woven nylon band but that didn't bother me as the colours they currently have are more than enough to choose from. The main colour of the band is 'royal blue' and it also has orange and white woven into the strap too. As with all straps you just click the old one off and click the new one off - so 'installation' was simple and easy. It feels comfortable and looks good too. Sometimes I felt with the sports band that when I was hot or sweaty the strap stuck or rubbed slightly. I've worn the band for over a month now and love it. If I had one suggestion to Apple (not a complaint) it would be to make the band slightly wider as the strap looks odd in comparison with the width of the actual Apple Watch - but that is me just being picky. I went with the 38mm band size (there is a 42mm available too) as I have small wrists and I felt that the 42mm might have been too big for me. I do have to say that Apple have gone above and beyond with the packaging again. It's hard to explain but if you do buy a watch strap then you will know what I mean. Do you have an Apple Watch? Have you tried or saw any new straps you might want? Let me know in the comments. I love a good chocolate cupcake! I also go through moods of enjoying the odd bit of dark chocolate so when I saw this recipe had dark chocolate in the cupcake and the icing - I thought I'd give it a try. This is another one of Cupcake Jemma's recipes so I am excited to try it seen as the first one turned out so well! 1. Preheat the oven to 160°C/350°F/Gas 4 and line 2 cupcake/muffin trays with 24 cases. 2. Finely chop the chocolate (this is best done in the food processor), then tip into a large bowl and stir in the dry ingredients and 1/2 teaspoon of fine sea salt. 3. Whisk the wet ingredients together in a separate bowl with an electric mixer (I prefer the free-standing type), then gradually add the dry ingredients, whisking until all smooth. 4. Transfer the mixture to a small jug (you'll need to do it in batches), and carefully fill the paper cases just over two-thirds full. 5. Bake for 20 minutes, or until they spring back when touched. 6. Leave to cool, transferring to a wire cooling rack after 5 minutes. 1. Melt the chocolate in a heatproof bowl over a pan of simmering water, making sure the base doesn't touch the water, then leave to cool for 5 to 10 minutes - the bowl should be just cool enough to handle. 2. Meanwhile, beat the butter with an electric mixer for 5 minutes, or until pale and smooth. Sift the icing sugar into a bowl, then add to the butter in two stages, beating well between each. 3. Gradually add the milk and beat for a further 5 minutes or until well combined. 4. Pour in the melted chocolate bit by bit, mixing as you go, then beat for a couple of minutes or until the icing is a rich, even chocolate-brown colour. 5. Once the cupcakes are cool, decorate them with the icing and enjoy. Let me know what you think in the comments below.!! I have a bad habit of pre-ordering books and then forgetting I have and then I come home from work and find them on my doorstep. I started watching the Lean Machines around the same time I started watching Tanya Burr and Jim Chapman - you maybe are thinking 'what's the connection?' well - John (one of the Lean Machines) is Jim's twin brother. They are both personal trainers and nutritionists and they have a YouTube channel too. Like may other YouTubers they have had the chance to create a book and it's a really good book. The book is full of information - if I'm completely honest - I was most interested in the recipe/food section. Closely followed by the exercises that you can do at home. I mean I have a gym membership but sometimes its nice to chill out and do some exercise in your back garden instead of the gym. In the book they spend a good deal of time talking about 'happiness' as we should all be happy. The recipes were the most interesting part for me - I especially liked the 'piri piri chicken' recipe and funnily enough they posted the recipe on their channel the other day showing how to make it. Have you bought the book yet? Let me know in the comments below. I'm a big lover of tomato soup - it's delicious and doesn't take much time. I loved when I Nana made it for my brother and me when we stayed with her. This is a simple and easy Mary Berry recipe from her book: 'Foolproof Cooking'. If I'm honest I didn't think it was going to taste of much but I will happily admit I was wrong - it's very flavourful and tasty. 1. Set a large, deep pan over a medium heat and add 1 tablespoon of oil from the sun-dried tomatoes. Add the garlic and stir-fry for a few seconds. 2. Tip the sun-dried tomatoes and tinned tomatoes, add the stock and sugar and bring to the boil, stirring all the while. Season with salt and pepper, then cover with a lid, reduce the heat and simmer for 10 minutes. 3. Remove from the heat and, using a hand blender, blitz the soup in the pan. Stir in the milk and cream and check the seasoning before heating through on the hob. 4. Serve hot with 1/2 teaspoon of basil pesto swirled on the top of each bowl of soup. You can stop here and just serve the soup but I liked the idea of pesto with tomato soup so I found a simple and easy recipe on the Food Network's website. You can find them HERE. 1. Combine the basil, garlic and pine nuts in a food processor and pulse until coarsely chopped. 2. Add 1/2 cup of the oil and process until incorporated and smooth. Season with salt and pepper. 3. If using immediately, add the remaining oil and pulse until smooth. Transfer to a bowl and add the cheese and mix together. Let me know what you think in the comments below. If you want something quick and easy and tasty then this is something you need to try!! It's been ages since I have done a tag post and so I thought I'd take a break from baking and change it up. 2. Have you ever been in love? 3. Have you ever had a terrible breakup? 4. I've not measured myself in ages - but I think around 5ft 4" or 5"
5. How much do you weight? 9. What is your favourite show? 9. Will & Grace or Friends! 10. Who are your favourite bands? 13. How old are you? 15. Quality you look for in a partner? 16. What is your favourite quote? 17. Who is your favourite actor? 19. Loud music or soft? 20. Where do you go when you're sad? 21. How long does it take you to shower? 22. How long does it take you to get ready in the morning? 23. Have you ever been in physical fight? 26. The reason you joined YouTube? 27. What are you fears? 28. Last thing that made you cry? 29. Last time you said you loved someone? 30. Meaning behind your YouTube name? 31. Last book you read? 32. The book you are currently reading? 33. Last show you watched? 34. Last person you talked to? 35. The relationship between you and the last person you texted? 36. What is your favourite food? 37. Place you want to visit? 38. Last place you were? 39. Do you have a crush? 39. I have a couple of celebrity crushes but thats about it! 40. Last time you kissed someone? 41. Last time you were insulted? 42. Favourite flavour of sweet? 43. What instrument do you play? 44. Favourite piece of jewellery? 45. Last sport you played? 46. Last song you sang? 47. Favourite pick up line? 48. Have you ever used it? 49. Last time you hung out with anyone? 50. Who should answer these questions next? 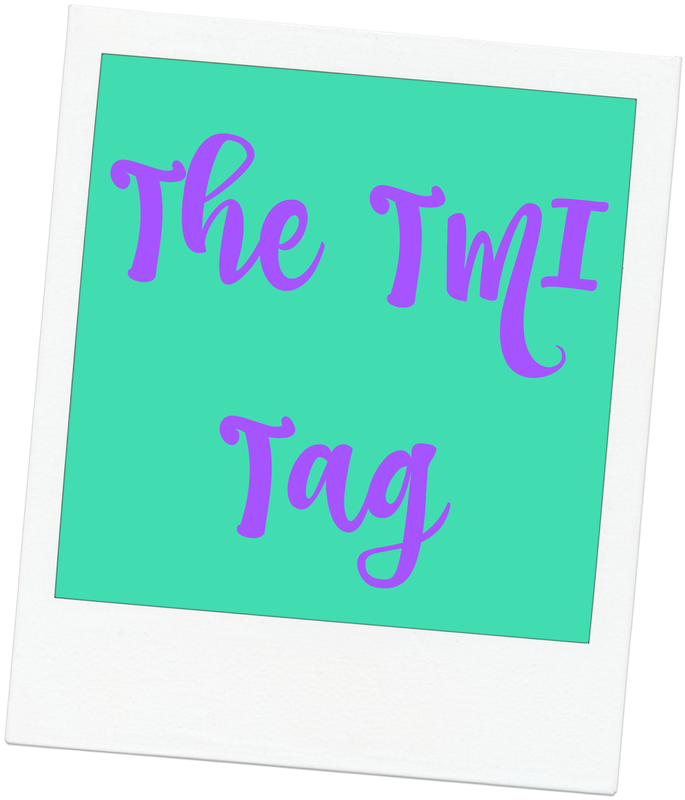 That's all the questions - feel free todo the TMI tag if you haven't already and let me know in the comments so I can check it out! I always wanted to find the perfect vanilla cupcake recipe or a base recipe that I could always use and then build on. I can finally say I have found it! It's all thanks to Cupcake Jemma. If you don't know who she is - just search her on YouTube and watch a few of her videos! The name kind of gives it away too! So both these recipes are available in video format on her YouTube channel but I have jotted them down and turned them into a blog post so I can look back on and use them! 1. Preheat the oven to 170°C and line a cupcake/muffin tray with 12 cases. 2. In a sieve over the mixing bowl - add the flour, caster sugar and bicarbonate of soda and sift them. 3. Add 125g of butter. 4. Add 2 large eggs. 5. Start the mixer on a low speed until everything is just mixed and then turn up to medium to high for 1 minute. 6. With the mixer on a low speed add the milk and vanilla extract. 7. Put the mixer back up to medium to high speed for one last blast (about 30 seconds). 8. Stop the mixer, remove the paddle and get as much batter off as you can. Scrape the sides with a spatula and give a final mix with the spatula to catch anything missed by the paddle at the bottom. 10. Bake for 22 minutes in the pre-heated oven. Check with a skewer - it should come out clean. 11. Leave in tray for 5-10 minutes and then transfer to a wire cooling rack. 1. Add the butter to a mixer and beat for 2-3 minutes on a medium speed. 2. The butter should now look very pale (edging on white) and be fluffy. 3. Add half the icing sugar to the bowl with the butter and start the mixer on a low speed. 4. Once its incorporated turn the mixer up to medium speed and beat for 2-3 minutes. 5. Add the last half of the icing sugar and again start on slow, then once mixed together, increase speed to medium and beat for another 2-3 minutes. 6. Turn down to a low speed and add the milk and vanilla extract. 7. Turn back up to a high speed for 1-2 minutes. Then either pipe or spread over the cupcakes. I've really pleased with these and can't wait to try making more! Let me know what you think in the comments.